Black River wars | Keeping Wilderness WILD! You are currently browsing the tag archive for the ‘Black River wars’ tag. *Editor’s note: The following is reprinted from a speech Ed Zahniser gave this past May in Schenectady, NY. 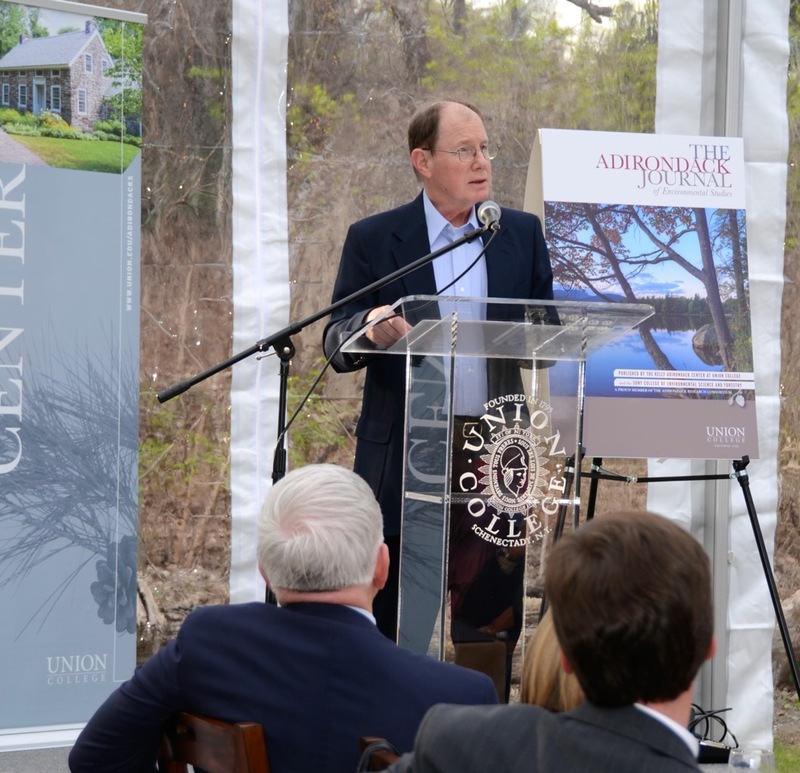 Ed Zahniser speaks at the Kelly Adirondack Center of Union College in Schenectady, NY, May 8, 2014. The Center includes the former home of Paul and Carolyn Schaefer and family. Photo: Dan Plumley, Adirondack Wild: Friends of the Forest Preserve. My father Howard Zahniser, who died four months before the 1964 Wilderness Act became law 50 years ago this September 3, was the chief architect of, and lobbyist for, this landmark Act. The Act created our 109.5-million-acre National Wilderness Preservation System. Had I another credential, it would be that Paul Schaefer—the indomitable Adirondack conservationist—was one of my chief mentors and outdoor role models. Paul helped me catch my first trout. I was seven years old. That life event took place in what is now the New York State-designated Siamese Ponds Wilderness Area in the Adirondacks. Izaak Walton should be so lucky. I spent many of those summer weekends with Paul in his Adirondack cabin, the Beaver House, near Bakers Mills. It was his heart’s home. And so for me, as in much of life, it’s not what you know. It’s who. But I must add that trying to fry three two-minute eggs the way Paul Schaefer liked them—with NO cellophane edges!—could bring down more wrath than Marine boot camp. And don’t ever let Paul sleep too late on Sunday morning to make it to mass in nearby North Creek. Paul Schaefer lived by letterheads. He had a double fistful over the years. I was born the same year as Paul’s letterhead group Friends of the Forest Preserve, formed in 1945 to fight the Black River Wars. I must now confess—with all due respect—that my siblings and I still often address each other as “Dear Friends of the Forest Preserve.” Today the official group is Adirondack Wild: Friends of the Forest Preserve. When I first read James Glover’s A Wilderness Original: The Life of Bob Marshall it reminded me that the many family friends I grew up taking for granted as national conservation associates of my father Howard Zahniser had been recruited by New Yorker Bob Marshall in his travels. Bob Marshall’s cohorts and co-founders of The Wilderness Society included Benton MacKaye, Bernard Frank, Harvey Broome, Aldo Leopold, and Ernest Oberholtzer. They carried on his wilderness work as The Wilderness Society after Marshall died at age 38 in 1939. MacKaye, Frank, and Leopold were trained foresters, as was Marshall, who also had a PhD in plant physiology. Broome was a lawyer for the Tennessee Valley Authority, where MacKaye and Frank worked as foresters. Also helping with Marshall’s early Wilderness Society work were his personal recruits Sigurd Olson, an advocate with Ernest Oberholtzer of today’s Boundary Waters Canoe Area Wilderness in Minnesota, and Olaus and Margaret E. “Mardy” Murie, who would play crucial roles in the creation of the Arctic National Wildlife Refuge. Bob Marshall inspired wilderness advocacy not only for federal public lands but also for the Adirondack wilderness of his youthful summers at the Marshall family camp near Saranac Lake. In July 1932, three years before The Wilderness Society was organized, Bob Marshall ran into a young Paul Schaefer atop Mount Marcy. Schaefer was photographing ravages of forest fires caused by careless logging of Adirondack High Peaks forests above the elevations that loggers had assured Bob Marshall and others that they would not cut. Paul Schaefer was doing what his conservation mentor John Apperson said we must do. Stand on the land you want to save. Take pictures so the public sees what is at stake. John Apperson’s rallying cry was “We Will Wake Them Up!” Paul would practice just that for more than a half century of wildlands advocacy. Atop Mount Marcy, not far above Verplanck Colvin’s Lake Tear of the Clouds, Bob Marshall captured Paul Schaefer’s wild imagination. Marshall called for wilderness advocates to band together, which took place with The Wilderness Society’s birth three years later, in 1935. In 1946, 14 years after his peak experience with Bob Marshall, Paul Schaefer recruited our father Howard Zahniser to defend Adirondack forest preserve wilderness. Apperson and Schaefer showed their documentary film about the dam-building threats to western Adirondack forest preserve lands at the February 1946 North American Wildlife Conference in New York City. My father had gone to work for The Wilderness Society the previous September 1945. After their presentation, my father told Schaefer that The Wilderness Society would help defend the western Adirondacks against dams in what became known as the Black River Wars. When they took up the gauntlet in 1946, to block the series of dams was universally deemed a lost cause. But Schaefer and Zahnie—as our father was known—went from town to town in western New York, testifying at public hearings, meeting with news people, and identifying and cultivating local advocates of wildlands. Schaefer invited Zahnie and our family to experience Adirondack wilderness firsthand that summer of 1946. Backpacking across the High Peaks wilderness that summer with Schaefer and his fellow conservationist Ed Richard, Zahnie remarked that the ‘forever wild’ clause of New York’s state constitution might well model the stronger protection needed for wilderness on federal public lands. The next summer, 1947, The Wilderness Society governing council voted to pursue some form of more permanent protection for wilderness. That 1947 vote set the stage for the 1964 Wilderness Act. The administrative classifications that Bob Marshall and Aldo Leopold had won to protect wilderness on federal, national forests were proving ephemeral. A housing boom followed World War II’s end in 1945. Federal bureaucrats started de-classifying administratively designated wilderness areas for exploitation of timber, minerals, and hydropower. Under Schaefer’s tutelage, Zahnie dove into the Black River Wars here in New York. Zahnie’s federal government public relations work had taught him the machinations of multi-media publicity. But from and with Paul Schaefer in the Adirondacks, Zahnie learned firsthand the art of grass roots organizing and stumping for wilderness. Paul Schaefer built a statewide coalition of hunters, anglers, and other conservationists and held it together by the strength of his personality for 50 or 60 years. If you’re looking for a job, there’s one that is probably going begging tonight. This truths our calling the Adirondacks and Catskills “where wilderness preservation began.” The epic early 1950s fight against the Echo Park Dam proposed inside Dinosaur National Monument in Utah built the first-ever national conservation coalition. Then, having defeated the Echo Park dam proposal by 1955, Zahnie and the Sierra Club’s David Brower put that coalition to work for the legislation that would become the 1964 Wilderness Act. Zahnie and David Brower, who then headed the Sierra Club, led the Echo Park Dam fight. Brower told Christine and me at the National Wilderness Conference in 1994 that Zahnie was his mentor in the practical technics of conservation advocacy. So this also puts David Brower in the direct line of mentoring by Bob Marshall and John Apperson and Paul Schaefer’s Adirondack wilderness advocacy. It was also during the western Adirondack dam fights that Zahnie met the philanthropist Edward Mallinkrodt, Jr., who helped bankroll the campaign against Echo Park Dam in the early 1950s. Then, in 1957, Zahnie addressed the New York State Conservation Council’s convention in Albany. He titled this speech “Where Wilderness Preservation Began.” In it Zahnie said: “This recognition of the value of wilderness as wilderness is something with which you have long been familiar here in New York State. It was here that it first began to be applied to the preservation of areas as wilderness.” In August 1996 Dave Gibson and Ken Rimany, Paul Schaefer’s grandson David Greene, and my brother Matt Zahniser and I and our four sons backpacked across the High Peaks to commemorate the 50th anniversary of the 1946 trip made by Schaefer, Ed Richard, and Zahnie. It remains crucially important to speak clearly and strongly for this unparalleled legacy of wildness—here and nationally—that we love and cherish. And only astute wilderness stewardship can put the forever in a wilderness forever future. Bob Marshall, who was Jewish, early fought for wilderness as a minority right. Marshall also fought for a fair shake for labor and other social justice issues. On his death at age 38 in 1939, one-third of Bob Marshall’s estate endowed The Wilderness Society, but two-thirds went to advocate labor and other social justice issues. Wilderness and wildness are necessity; they are not peripheral to a society holistically construed. This bit of biography underscores how Congress declares the intent of the National Wilderness Preservation System Act to be “for the permanent good of the whole people…” —and this by a 1964 House of Representatives vote of 373 to 1. Isn’t that amazing? And by an earlier Senate vote of 78 to 12. Wilderness and wildness are integral to what Wendell Berry calls the circumference of mystery. Wilderness and wildness are integral to what the poet Denise Levertov calls the Great Web. Wilderness and wildness are integral to what the Reverend Dr. Martin Luther King Jr. calls our inescapable network of mutuality. Wilderness and wildness are integral to what God describes to Job as the “circle on the face of the deep,” to the bio-sphere, to our circle of life, to our full community of life on Earth that derives its existence from the Sun. The prophetic call of wilderness is not to escape the world. The prophetic call of wilderness is to encounter the world’s essence. John Hay calls wilderness the “Earth’s immortal genius.” Gary Snyder calls wilderness the planetary intelligence. Wilderness calls us to renewed kinship with all of life. In Aldo Leopold’s words, we will enlarge the boundaries of the community—we will live out a land ethic—only as we feel ourselves a part of the same community. By securing a national policy of restraint and humility toward natural conditions and wilderness character, the Wilderness Act offers a sociopolitical step toward a land ethic, toward enlarging the boundaries of the community. Preserving wilderness and wildness is about recognizing the limitations of our desires and the limitations of our capabilities within nature. But nature really is this all-encompassing community—including humans—that Aldo Leopold characterized simply as “the land.” With preserving designated wilderness we are putting a small percentage of the land outside the scope of our trammeling influence. President Lyndon B. Johnson signed the Wilderness Act into law on September 3, 1964. Our mother Alice Zahniser stood in our father’s place at the White House signing, and President Johnson gave her one of the pens he used. The future of American wilderness lies in continued concerted advocacy by spirited people intent on seeing our visionary legacy of thinking—and feeling—about wilderness and wildness taken up by new generations. Howard Zahniser said that in preserving wilderness, we take some of the precious ecological heritage that has come down to us from the eternity of the past, and we have the boldness to project it into the eternity of the future. If you are looking for good work, you will find no better work than to be a conduit for those two eternities. Go forth, do good, tell the stories, and keep it wild. Ed Zahniser recently retired as the senior writer and editor with the National Park Service Publications Group in Harpers Ferry, West Virginia. He writes and lectures frequently about wilderness, wildlands, and conservation history topics. He is the youngest child of Alice (1918-2014) and Howard Zahniser (1906–1964). Ed’s father was the principal author and chief lobbyist for the Wilderness Act of 1964. Ed edited his father’s Adirondack writings in Where Wilderness Preservation Began: Adirondack Writings of Howard Zahniser, and also edited Daisy Mavis Dalaba Allen’s Ranger Bowback: An Adirondack farmer: a memoir of Hillmount Farms (Bakers Mills).